Home Equestrian News Riders in orange take team contest by storm. Riders in orange take team contest by storm. THE Netherlands has jumped its way to the top of the team standings during the first day of the Team Competition in Caen’s d’Ornano Stadium. (Photo © PSV Photos). London silver medallist Gerco Schroder cemented his country’s good run during this afternoon’s session when notching up a clear round aboard his scopey chestnut Glock’s London NOP. The stallion gave the top pole on 12a a bit of a rub but it stayed in its cups to give this on form nation a strike rate of three out of four clears. 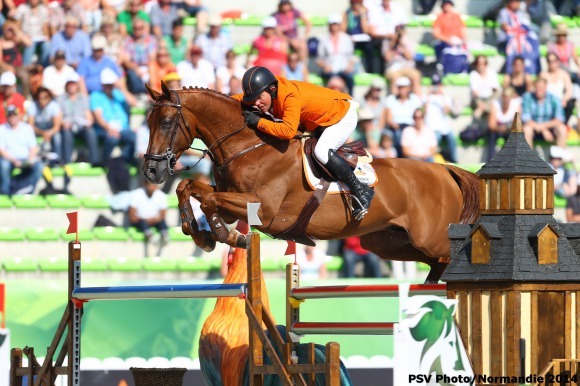 Their third rider, Jur Vrieling, was the only Dutch contestant to blot his copybook, netting nine unwanted penalties with his usually consistent jumper VDL Bubalu. The bay entire son of Baloubet Du Rouet, who boasts a unique and usually effective jumping style, began badly by taking out the front rail at the Viking ship oxer at 3, followed by the front rail of the treble at 4a. He finished up, too, by exceeding the 83sec time allowed. The USA is in second, carrying forward 8.72 penalties after its leading lady Beezie Madden and Cortes C were world class as well as foot perfect this afternoon around Frederic Cottier’s tricky 13-fence track. Germany, third (8.82), was already home and dry with a qualifying score bagged by Daniel Deusser and Marcus Ehning’s clear rounds, as well as Christian Ahlmann’s four faulter, when Ludger Beerbaum and his agile grey mare Chiara 222 jumped. They, too, looked to be on for a clean performance until they took out the back rail at 11 for four faults. Deusser commented: “I was lucky today and we didn’t lose our position. My horse is always more careful at the beginning, so he was a bit slow, but after a few jumps he got better and better. Overall I’m satisfied with him. France is in fourth, Patrice Delaveau, their third man in – and carrying forward just 0.08 of a penalty from yesterday’s speed round – made the crowd go wild when he jumped clear aboard Orient Express HDC. The pair, though, lived a little dangerously when rattling the back rail of that Rolex green and yellow oxer at 11, but they won out and now top the individual rankings ahead of US rider Beezie Madden and Sweden’s Rolf-Goran Bengtsson. Brazil, fifth, are the only other nation besides The Netherlands to have recorded three clear rounds today. Marlon Modolo Zanotelli and Ad Clouwni set off this venue’s rousing clear round music, while Rodrigo Pessoa, the penultimate competitor into the arena this afternoon, emulated this achievement aboard his Hanoverian gelding Status. The other teams who will appear in the d’Ornano Stadium tomorrow are Canada, Sweden, Ireland, Columbia and Ukrane. The jubilant and vocal ninth-placed Columbians had two good rounds in the bag from the morning session (Carlos Lopez was clear, while Daniel Bluman recorded just four faults) but they were despondent when their leading rider Roberto Teran Tafur — carrying forward just 1.93 from Tuesday’s speed class — crashed through the second part of the treble with Woklahoma, after which their challenge unravelled. However, Andres Rodriguez saved the day and secured qualification with an eight faulter aboard Caballito. Some favoured nations have made shock exits from the contest. Twenty one teams in total are now out of the competition, including Great Britain, Belgium, Switzerland and Denmark. For the Swiss Olympic Champion Steve Guerdat, his four-fault performance with Nino Des Buissonnets was disastrous as it saw his nation relinquish their all-important 10th and final team qualifying slot. Great Britain’s dire fortunes continued this afternoon when Joe Clee and Wonder Why’s clear round up to fence 11 turned into an eight faulter with the back rail nudged off the Rolex oxer at 11, while they took out the vertical four strides away at 12a too. Hello Sanctos’s hoof on the tape of the water cemented Britain’s bad day and left world number one Scott Brash on a knife edge as to whether he would be one of the top 50 riders to jump tomorrow — he will be as he lies in 36th on the individual table. The 22,000 seater d’Ornano stadium was two-thirds full this afternoon, the vocal and supportive spectators enjoying some fabulous sporting action along with summer sunshine. Tomorrow the top 50 riders come forward for the ultimate team test when the podium placings will be decided. Previous articleAllen takes early Jumping lead for the Emerald Isle. Next articleDutch win Jumping gold by a whisker.